SSD Midge is going to have puppies! Last night, she went to the vet for an ultrasound, and the vet saw four tiny puppies, with the possibility that there are a few more hiding behind their brothers and sisters. We could even see the heartbeats! 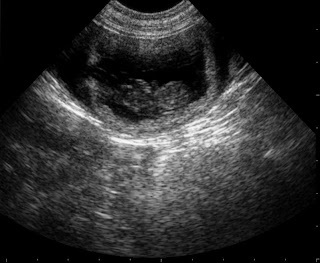 The puppies will be born sometime around January 29, 2011. The weeks before Christmas are busy for almost everyone, and it was no different for Nubble. Donna and Lindsey took him to the Berkshire Mall so he could experience all of the hustle and bustle. This was an outing just for Nubble to gain experience. They didn't plan to do any shopping - a good idea since it can be stressful to try to find the perfect gift and train a dog at the same time. At the mall, Nubble got lots of practice doing greetings. Many people came over to say hello. We have no doubt that he brought a smile to people's faces! As they walked by Santa, there wasn't a line, and Santa called them over. Nubble did very well. Santa was great with him, staying very calm while petting and talking to him. 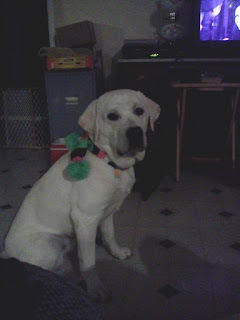 At first, Nubble grabbed Santa's fuzzy sleeve, but when cued, he did a nice "leave it." When Santa was petting him, Nubble paid attention to Donna, just like he's supposed to. Then, while Donna and Santa had a conversation, Nubble lay down at Santa's feet. They took Nubble outside for a break. However, as they were walking toward the doors, another dog was about to come inside. Nubble barked a couple times when he saw the dog, but Donna and Lindsey did a nice job setting Nubble up for success. They timed their departure from the mall so that Nubble was going out one set of doors while the other dog was coming in the other doors. It worked well because Nubble was able to stay focused. When the went back inside, Donna and Lindsey kept their eyes open for the other dog. They saw him over by Santa waiting to have his picture taken. Using power treats, Donna was able to keep Nubble's attention on her while they went past the other dog. Nubble did great! They practiced stairs at the mall, although they only practiced going down the stairs. It was too crowded for Nubble to be successful going up the stairs, especially since he still has a tendency to rush up. They took the elevator up and the stairs down. Nubble did very well going down the stairs. He also does very well with elevators. This particular elevator had glass walls, however, which startled Nubble at first. He seemed surprised to be able to see everything move. After riding the elevator a few times, though, he settled down. Over all, he did wonderfully with the crowds. His loose leash walking was great! They also practiced "leave it" a lot. When they were in line to get a soft pretzel, there was a piece of pretzel on the floor. They practiced "leave it" with that piece of pretzel, and Nubble was successful! Donna then picked up the pretzel piece and threw it out so he wouldn't be tempted. While they were waiting, Donna dropped her keys a few times and Nubble would pick them up for her. It was a fun game to keep him occupied, and the people around them enjoyed watching Nubble work! It was quite a successful outing. The Northeast Division held a Christmas get-together last week. Nubble went straight for the Christmas tree to investigate. They played dog games and the dogs got to open presents. They got squeaky toys! Meg, the Northeast coordinator, brought an activity board made of wood with little wells for treats. Each well had a sliding lid that the dogs could open with their paws or nose. SSD Slate and Burnaby did well sliding open the doors. Nubble had a different method of getting the treats out. He picked up the board and dropped it. When a treat fell out, he picked the board up and dropped it again until he got all the treats out! Nubble went to the vet to be neutered. Although he was a little cautious for a few days afterward, you would never have known he had surgery. He was acting just like his normal self. Nubble's loose leash walking has been coming along. Donna has stopped using the gentle leader halter because it causes Nubble too much stress. Instead, she uses an EasyWalk harness, which fits over his chest and shoulders. Nubble does very well with that. Donna only tries to use the EasyWalk when she knows there is going to be a challenging environment. Otherwise, she works with the leash attached the Nubble's collar. It's been working well. Nubble now accompanies Donna on her Saturday morning errands, and she feels completely confident holding a cup of coffee when they leave Wawa. We're looking forward to what the new year brings for Nubble! SSD Burnaby (black), Scotia (yellow) and Yukon (chocolate) wish you happy holidays! More Puppies on the Way? Are there more puppies on the way? Keep your fingers crossed! SSD Midge and SSD Pearl were bred, and we're hoping that both of them will have puppies soon. Midge was bred to SSD Sweet William, SSD's founding stud. 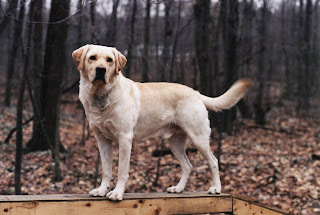 Will was a handsome yellow lab who was very healthy and produced healthy offspring. He loved people and was very intuitive - excellent traits for a service dog. If Midge is pregnant, this will be her second litter, and we're hoping to bring some of Will's traits back into the line. Pearl was bred to Lobuff Hollyridge Wizard of Oz ("Wizard"). 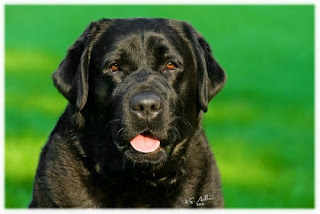 Wizard, a handsome black lab, comes from Hollyridge Labradors, a kennel in Rhode Island that breeds and shows labs. 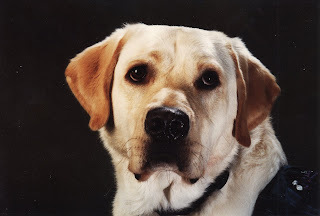 Although we have not actually met Wizard, we have heard a lot about him, and he has several traits that we value in service dogs. He is very confident in his environment and is comfortable in new situations. When he went to the Westminster Dog Show, he was calm and had no problem walking around outside on a loose leash and pottying on many different surfaces. If Pearl is pregnant, we're hoping Wizard passes these traits on to his offspring. 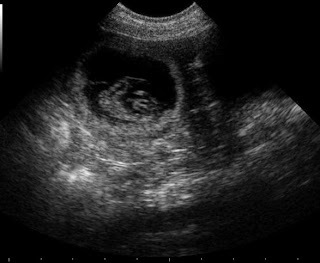 We'll find out on December 28 is Midge is pregnant when she goes to the vet for an ultrasound. 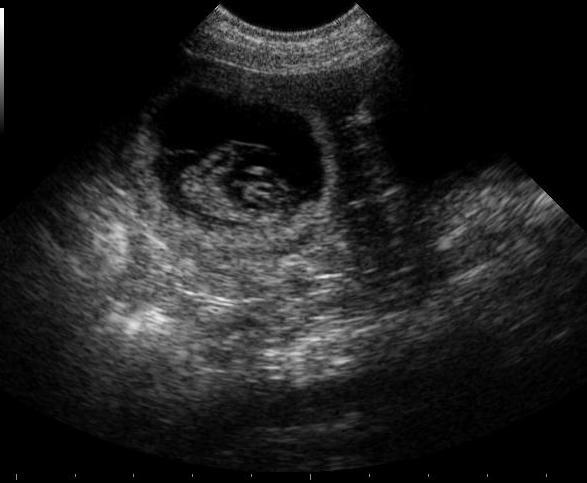 Pearl's ultrasound is scheduled for January 3. 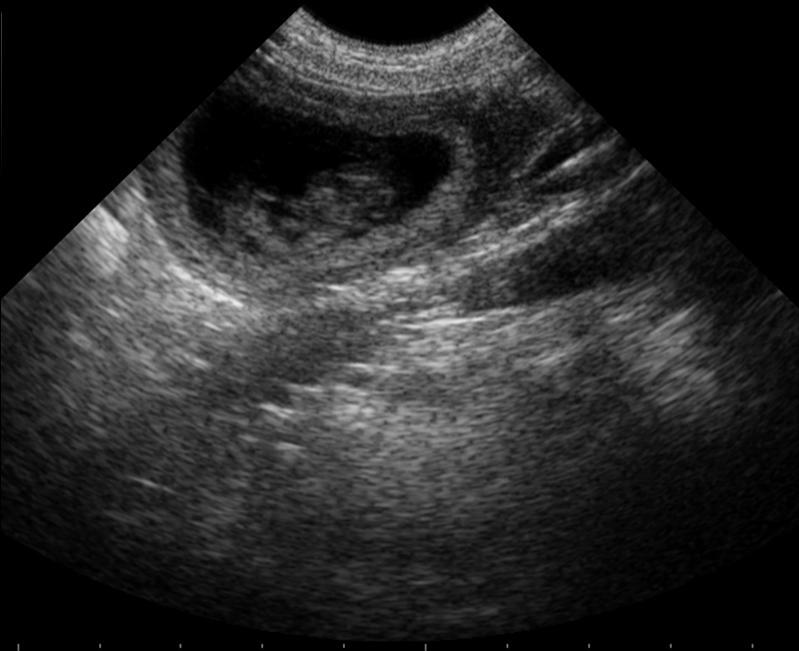 We hope we'll have sonograms of puppies to share with you! When the weather turns bitter cold, dogs tend to get less exercise. They and their handlers take shorter walks, and the dogs spend less time running around outdoors. This cold weather might be terrible for taking walks, but it's perfect for swimming. Yes, swimming. Some of our puppy raisers take their service dogs-in-training to the Canine Spa for a few hours of playtime in the water. Located in Dillsburg, the Canine Spa is an indoor pool, where the dogs can swim and interact with other dogs. It has tennis balls and other floating toys, so the dogs have a great time romping in the water, retrieving tennis balls. The Canine Spa generously lets SSD dogs swim for free. (It costs $15 for all other dogs to swim.) There's even a bathing area where the dogs can rinse off or take a bath after their swim. SSD Cabo loves to retrieve tennis balls from the water. SSD Taz watches SSD Scotia swim back with her favorite ball. Our dogs always have a great time swimming. It's a fun way to work off some of that winter energy, plus they have the opportunity to socialize with other dogs. For more information about the Canine Spa, visit www.dogswimming.com. When you raise a puppy for a service dog organization, it is inevitable that people will question you when you enter public buildings. Sometimes you will even be denied access unless you leave your dog outside. It's very important for puppy raisers to understand the laws about public access for service dogs-in-training. It's so important that we made it the topic of our lecture on Wednesday evening. If you're a puppy raiser and someone tells you you can't bring your service dog-in-training into their place of business, what should you do? Smile. Always smile and be tolerant of people who don't know or understand the laws about service dogs and service dogs-in-training. Service dog and service dog-in-training laws are not always well known, and employees may be worried that they'll get in trouble with their manager if they allow the dog inside. As a puppy raiser, it's your job to calmly and politely explain that service dogs-in-training are not pets and they are allowed to go anywhere that is open to the public. Sometimes, you may need to ask for a manager. If the manager is unfamiliar with the laws and tells you that your dog-in-training must leave, don't force the issue. Smile and thank them for their time. 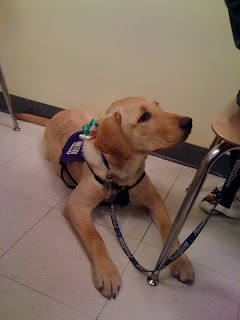 If you're a puppy raiser for SSD, take their names and write down where and when you were there. We will be happy to call and talk with them about our program and the laws about service dogs and service dogs-in-training. 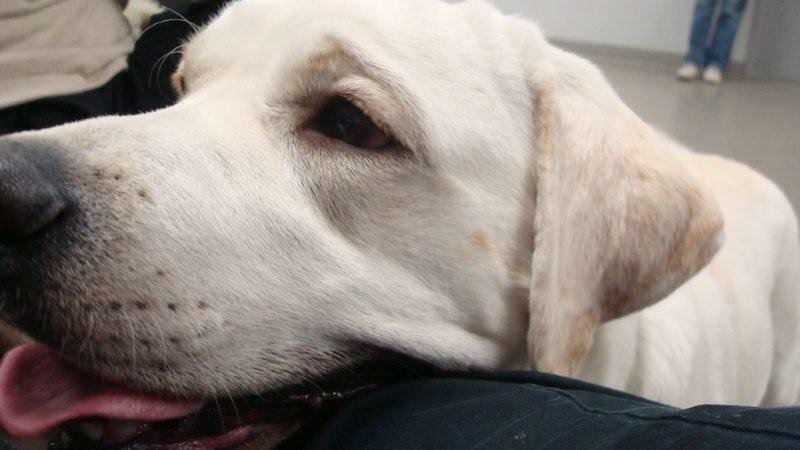 There are a few places where public access for service dogs-in-training can be refused. Private residences, private clubs, places of worship and some areas of hospitals can ask you not to bring your dog-in-training inside. In addition, if allowing the dog inside would cause a fundamental alteration in the way a business operates, a business can refuse to allow the dog inside. For example, if a candy factory requires everyone to wear hairnets when taking a tour, they can refuse to allow your dog-in-training to accompany you. There are exceptions to these exceptions, however. If any of these places holds an event that is open to the general public, they must allow your service dog-in-training access. 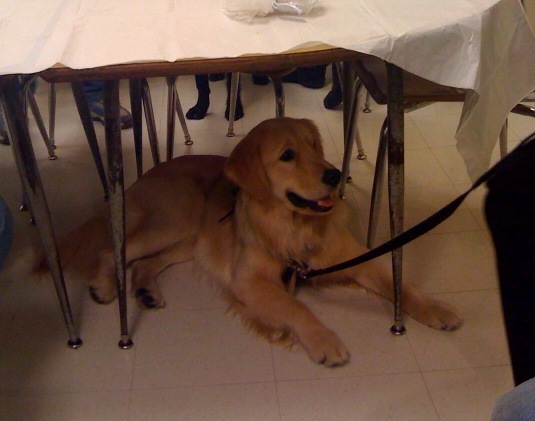 For example, if a church holds a bake sale or a spaghetti dinner that is open to the public, legally they must allow your dog-in-training to attend, even if they normally ask you to leave the dog at home for worship services. No matter where you go, whether you and your dog-in-training are asked to leave or whether you're welcomed inside, always be polite and smile. 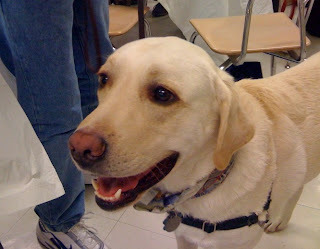 We want a service dog's training to be a positive experience for everyone. Welcome to our newest SSD dogs! Meet SSD Samee Mae and SSD Dee! 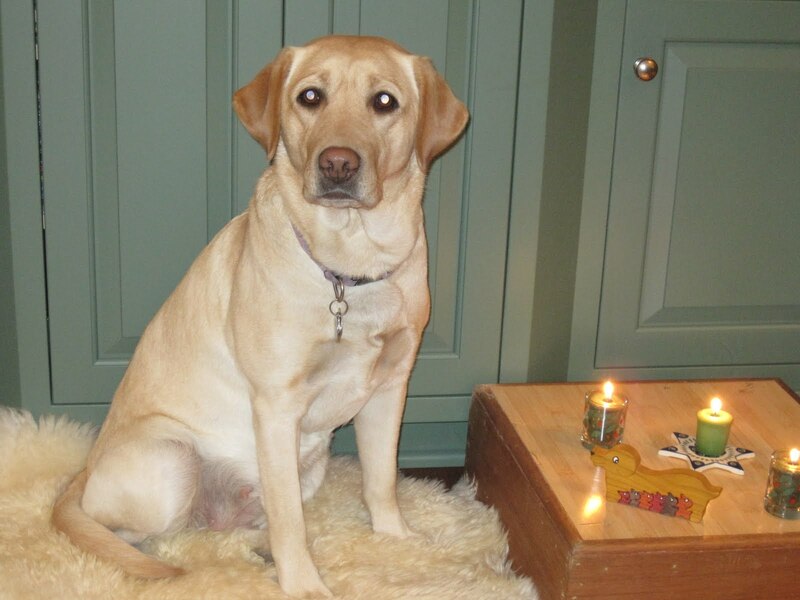 Samee Mae comes to us from Guide Dogs of Texas, Inc. 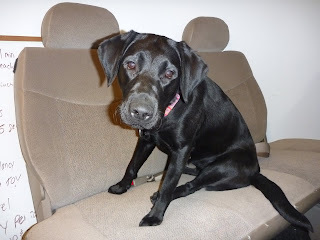 Her mother, Poppy, flew all the way to Harrisburg to be bred with SSD Fire, and it's usually the custom that one puppy goes to the stud dog's organization, as long as the litter of puppies was large enough. Poppy had eight puppies! 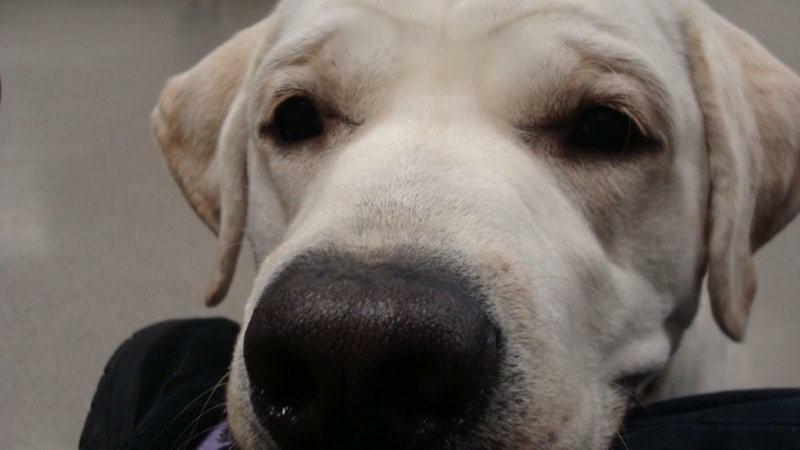 Samee Mae is part of Guide Dogs of Texas' "A" litter. (Her original name was Aggie.) We're very happy that Samee Mae is joining SSD! When we learned that we would be getting one of Poppy's puppies, our puppy coordinator and one of our trainers flew down to Texas to pick one out. To help us choose a puppy that would have a high chance of being successful in our program, we used puppy temperament testing, which looks at the puppy's reactions to distractions and loud noises. We also look at their attention and focus, among other things. After all that, we chose Samee Mae! Thank you to everyone at Guide Dogs of Texas! We enjoyed our time with you. Good luck to all of Samee Mae's brothers and sisters as they learn to become guide dogs! The other new member of SSD is Dee. 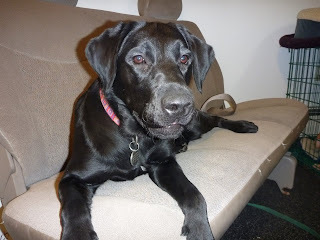 She is a one and a half year old black lab from Guiding Eyes for the Blind. She is a sweetheart! 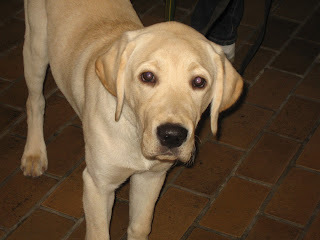 Right now, she is in advanced training, and we're evaluating her for our breeding program. We are very lucky to have such wonderful relationships with other guide and service dog programs such as Guiding Eyes for the Blind and Guide Dogs of Texas! Even puppies have to take tests. 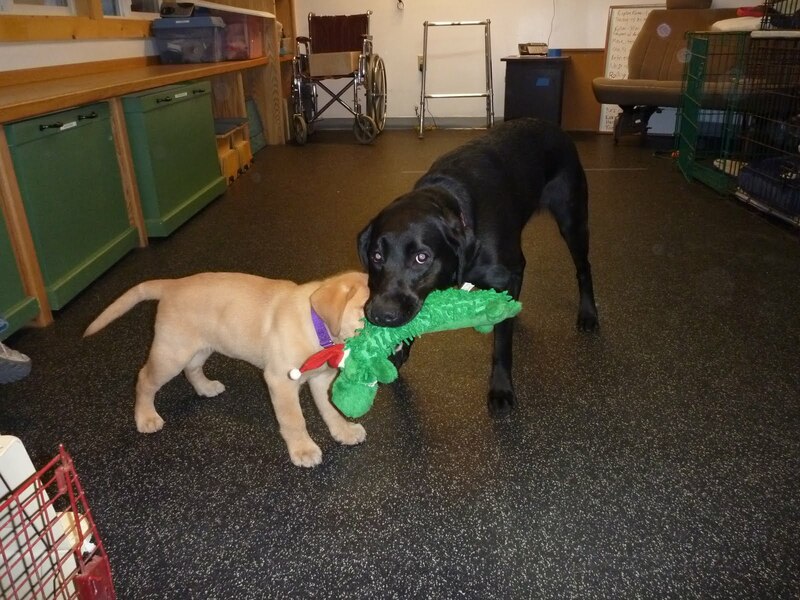 Our service dogs-in-training had their evaluations on Wednesday to see how the puppies are doing in their training. Each puppy and it puppy raisers met individually with one of our trainers, and they went over all of the things we've been doing in puppy class. In fact, evaluations are less like tests and more like one-on-one puppy classes. 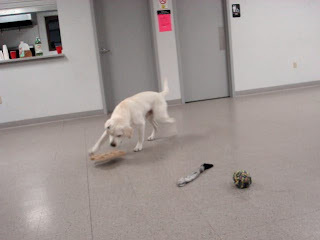 SSD Taz's evaluation started as soon as the trainer called him back to the room. He and his puppy raiser had to demonstrate loose leash walking. Loose leash walking is one of the most important things a dog can learn. To help the dog be successful, puppy raisers need to be constantly aware of their environment. If there are any distractions, such as other dogs, food, etc., the puppy raiser needs to be prepared and take measures to help the dog continue to walk on a loose leash. For example, we put a tray full of dog food on the floor in Taz's evaluation area. Taz did great when he first walked in the room. He stayed focused on his puppy raiser and completely ignored the food. Later, when he did notice it, his puppy raiser, Kelly, asked the trainer to pick up the food because it would be too much of a distraction for Taz. When puppy raisers or partners are working out in public, for example in a restaurant, it's perfectly fine to ask someone to sweep up the floor around your table so the dog isn't distracted. We want the dogs to be successful, and we try to make it as easy as possible for them. 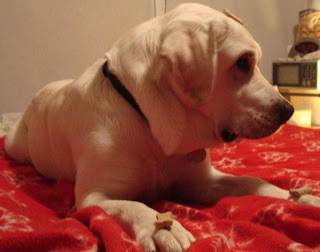 If a service dog-in-training or even a service dog is focusing on a french fry in the aisle, it's going to be very hard for them to focus on their handler, and they may even try to bolt for the fry, causing a disruption in the restaurant. Once Taz and his puppy raisers got into the room, we started with body handling. 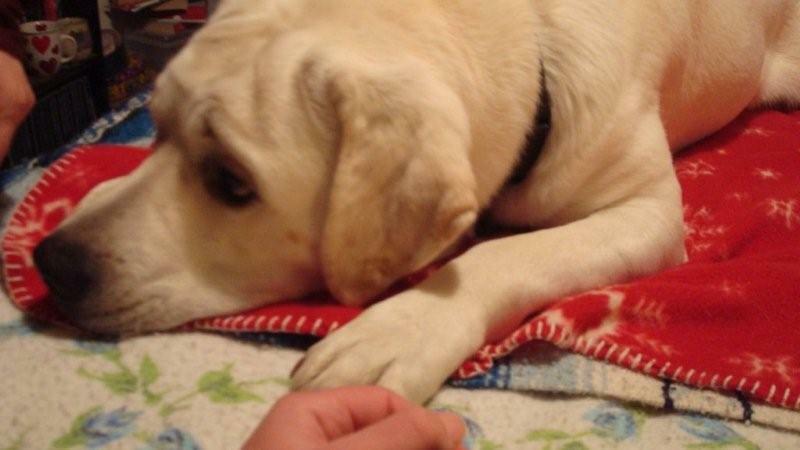 Service dogs need to be comfortable being touched everywhere, without nipping at their handler's hands. Kelly checked Taz's teeth, ears and feet, all places where dogs might not necessarily enjoy being touched. Next we did basic obedience, such as sit, down, stand and stay. Watch Taz sit, down and stand! Recalls are right up there with loose leash walking, in terms of importance. A good recall can save a dog's life. In this video, Taz comes right to his puppy raiser when she calls him. 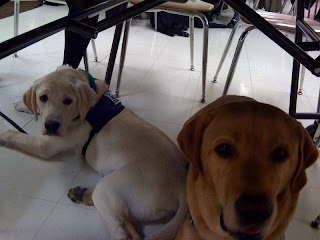 Puppy class is divided into semesters, and this semester, we had been working on the cues "get dressed" and "heel." Taz demonstrated his progress in putting his head through his harness. To teach "heel," we use a box to anchor the dog's front feet so he just swings his back feet around until he's in the heel position. We use the box because not only does it help create a nice, snappy "heel," but it also helps our puppy raisers learn about shaping. They need to break down the "heel" behavior into tiny steps in order to teach it. Here, Taz demonstrates how to use the heel box. Watch how his back feet move while his front feet remain stationary. Finally, we looked at greetings. If the handler gives someone permission to pet their dog, the dog must stay calm and focused while they're being petted. However, the handler does not have to say yes when someone asks to pet the dog. 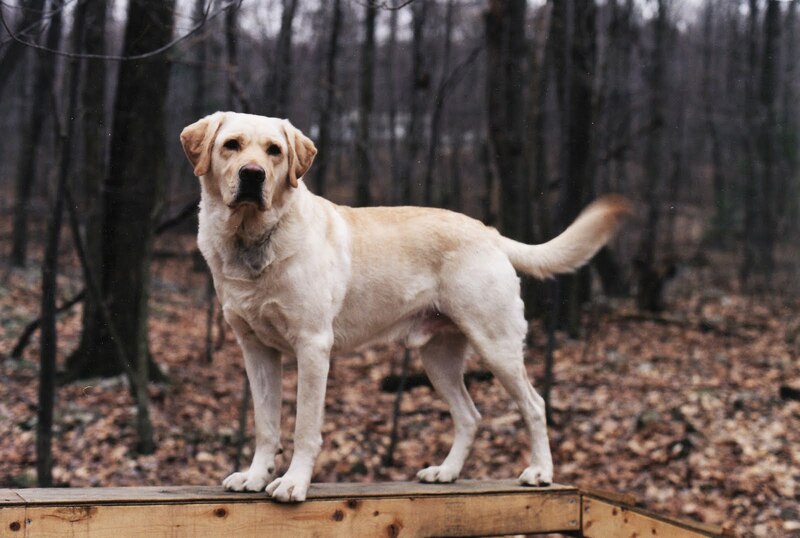 Service dogs and service dogs-in-training are working dogs, and the handler has the right to ask people not to pet their dog. 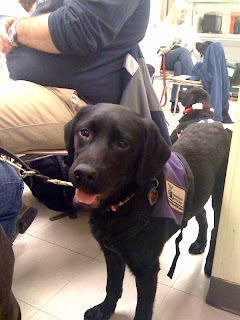 Taz and the other dogs-in-training did well on their evaluations. We're looking forward to the next semester of puppy classes! SSD Dylan is well on his way to becoming a service dog, and now you can follow his journey on our blog! 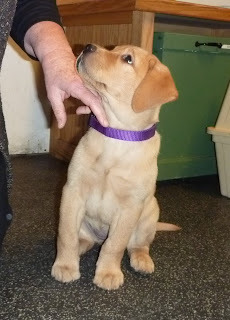 Dylan is one of the Rock and Roll Stars puppies that you helped name. He and his four brothers and sister are now six months old, and they are all with their puppy raisers learning the basics. They have certainly grown - Dylan weighs 53 pounds! He is a very relaxed and attentive dog. When he goes to work with Mike or Kelly, his puppy raisers, he lays beside them or under the desk. He certainly enjoys being around people, but he can handle being on his own and doesn't usually whine or bark if left alone. Dylan loves to swim! Over the summer, Mike and Kelly took him up to their cabin, and he went straight into the creek! He enjoys being outside and has been hiking several times. Now that it's winter, Dylan saw snow for the first time at the cabin. He loved playing in the snow! His puppy raisers took him Christmas tree shopping. It was a challenging outing for him because of all the new smells. He was very focused on sniffing everything, but he settled down after a while. It was a successful outing! 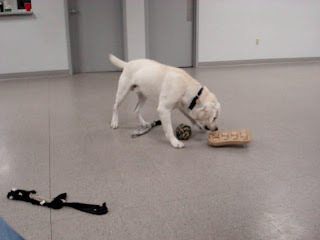 So far, Dylan is doing well in his formal training. He knows "sit," "down," "stay," and "stand," and he's working on "heel." We teach the SSD dogs how to heel using a box. The dogs put their front feet on the box, which helps them anchor their front feet so just their back feet swing around until they're in the "heel" position. Eventually, we remove the box and have the dog pivot into the heel position with all four feet on the floor. Dylan is doing great with the heel box! He will pivot his back feet almost all the way around the box. His puppy raisers' are now working with him to get him to continue moving his back feet until his body touches his puppy raiser's leg. Dylan's biggest challenge is greeting other dogs. He just wants to play with them. Service dogs need to stay calm when they're in the presence of other dogs, and when they're given the opportunity to greet other dogs, they still need to stay calm so they can easily turn their attention to their partner. Mike and Kelly are working hard to help Dylan learn how to greet other dogs calmly. They use the penalty yards method. When they see another dog ahead, they'll approach slowly, clicking and treating Dylan for walking on a loose leash. As soon as he starts pulling, they back up. Once Dylan is by their sides again and focused on them, they walk forward, always trying to keep the leash nice and loose. They continue backing up and moving forward until they reach the other dog. The goal of the penalty yard method is to keep the dog calm and help him realize that he can't just lunge toward the thing that he wants. Mike and Kelly also try to have Dylan practice greeting other dogs in a controlled situation. 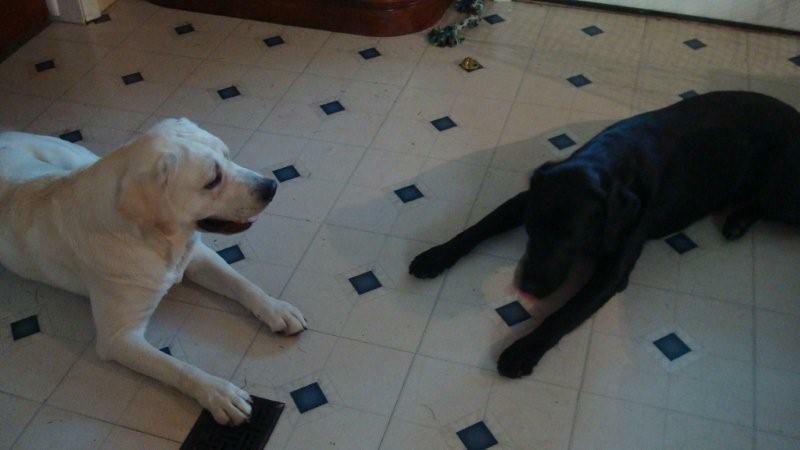 Mike's brother has a lab, and they have the two dogs greet each other calmly. Hard work does pay off - Dylan was recently at the mall with one of our volunteer trainers and SSD Wrigley, one of our demo dogs. In the beginning of the outing, Dylan was excited to see another dog, but he settled down and was able to focus on his puppy raisers. Every now and then he would try to get Wrigley to play, but for the most part, he did very well. Nice progress! Look for more posted about SSD Dylan in the coming weeks. 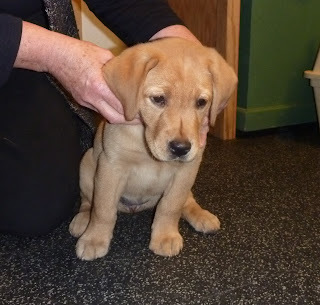 We're looking forward to sharing his progress as he learns how to become a service dog! It seems like the closer we are the holidays, the busier we become. SSD Nubble has had an extremely busy month. 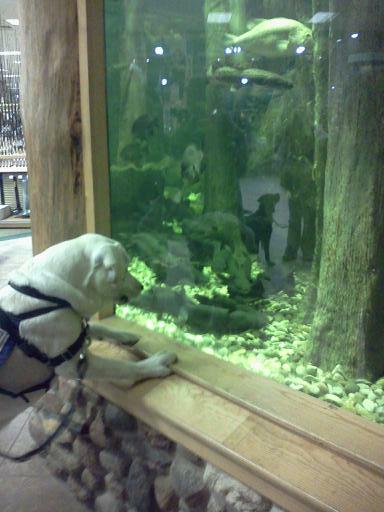 The Northeast Division went to Cabela's with the dogs for a public outing. Cabela's is an outdoor outfitter, and their decor includes an aquarium and real stuffed animals. Nubble loved the aquarium, and he didn't mind the animals. Even though he eyed some of the fake trees in the store, he actually do anything. Overall, he did a very nice job in Cabela's. Afterward, the Northeast group went to the local Pizza Hut. Again, Nubble did great, even though there were other dogs sitting next to him. Nubble and some of the other dogs had their 12-month evaluations. We evaluate all of our dogs-in-training when they're 12 months old. The dogs stay overnight at the kennel before their evaluation. The evals help us determine whether the dogs will be successful as service dogs. Since SSD Slate from the Northeast was also getting evaluated, the two dogs carpooled. 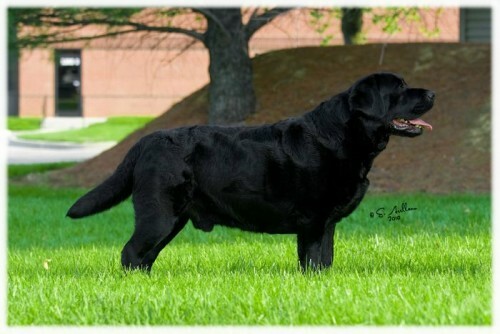 After the Cabela's outing, Slate went home with Nubble and spent the next day with him. Nubble loved having another dog to play with! Gizzy, the family pet, barked a bit, but Slate took it all in stride. Donna then took both Nubble and Slate to the kennel for their evaluation, and Slate's puppy raiser picked them both up afterward. Wow, was Nubble tired when he got home! The Northeast Division joined our Harrisburg area group for our SSD Holiday Party. We always have a lot of fun at the holiday party. Everyone brings a dish to share, each dog gets a new toy, and we play games. Even though it's fun, it can also be a very challenging evening for the dogs. There are lots of distractions and activity going on. The evening was a challenge for Nubble, particularly because there were so many new dogs there. Donna worked very hard to get him to walk calmly on a loose leash without barking. They made it down the hallway to the room and they sat at one of the tables. Nubble had trouble relaxing at the table, however. He would sit, then stand, sit, then stand. Donna took him outside to relax, but it was just too much for him when they tried to rejoin the party. Donna put him the crate in the van so he could relax away from the other dogs. Before she put him in crate, Donna worked on stairs with Nubble. Focusing on stairs and training helped Nubble calm down. Even though the party was too challenging for Nubble on that night, Donna still had a good time. She got some ideas for training "leave it" while watching the D-O-G game, particularly when Slate stayed still while his puppy raiser put treats on his paws. Nubble does a similar "leave it," although the treat is on his head instead of his paws. He thinks it's a great game. When Donna says okay, he flips the treat into his mouth. After the party, Donna tried training him to leave food on his paws. She thought it might be difficult for him because the treats were in his line of sight rather than on the top of his head. But Nubble did great! Once he figured out what Donna wanted him to do, he listened very nicely. In the end, Nubble could do "leave it" with treats on both paws and on his head! Great progress! Now that it's cold outside, bathing Nubble has gotten a little more challenging. He usually got a bath outside, but now he needs to use the bathtub. Because he has gotten so big, Donna can't lift him into the tub, so he needs to get in and out on his own. Meg, the Northeast Division coordinator, suggested laying towels down in the tub so it's not such a slippery surface. It worked! Donna used shaping to help Nubble understand that he can put his back feet in the tub, but once he figured that out, he had no problem getting in and out. Once he gets more comfortable in the tub, Donna will actually bathe him. Donna also recently discovered a local self-serve dog wash, and she took Nubble. It was set up exactly like a car wash, only indoors. There was a waist-high table with a ramp so Nubble could easily get on the table. The hose had different settings - wash, rinse, de-skunk, etc. (No, Nubble didn't need to be de-skunked!) Nubble had no problem going up the ramp, and he sat and stood nicely for his bath. He also did great getting dried off with the drying hose. Nubble went with Lindsey when she got her driving permit. He practiced "under" while she filled out her paperwork, and waited nicely in the waiting room with Donna while Lindsey took her written test. A toddler was pushing her own stroller around the waiting room, but Nubble ignored her. Nice job! Next week, Nubble goes to the vet to be neutered. Wish his a speedy recovery! What could be better than an evening of food, presents and games? An evening of food, presents and games with the dogs! We had our annual Holiday Party on Wednesday evening at the Harrisburg Academy, and we had a wonderful time! Our puppy raisers, puppy sitters, and partners joined us for a potluck dinner, presents and games. 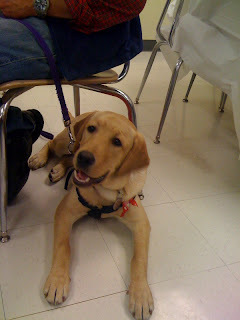 We're very happy that the puppy raisers from the Northeast were able to join us! While we ate, the dogs relaxed under the tables or chairs nicely. We're so proud of how well they did! Each year, we do a gift exchange for the dogs. Everyone brings a dog toy, and we put them all in a huge bag. Then each dog picks a present. There were a lot of happy dogs in the room! We always play games during our Holiday Party, and this year we played D-O-G. We divide the dogs and puppy raisers into two teams. The first team sends a dog into the middle to do a trick or skill. The other team then has to send a dog to the middle who can also do that trick. If that dog is unable to do it, that team gets a "D." Play continues until one team spells D-O-G.
SSD Aladdin picks up his leash, heels, and walks backwards. SSD Slate, one of the Crayon puppies from the Northeast, can lay in a down and "leave it" while his puppy raiser puts treats on his paws! SSD Dylan rests his head in his puppy raiser's hand for a nice "visit." 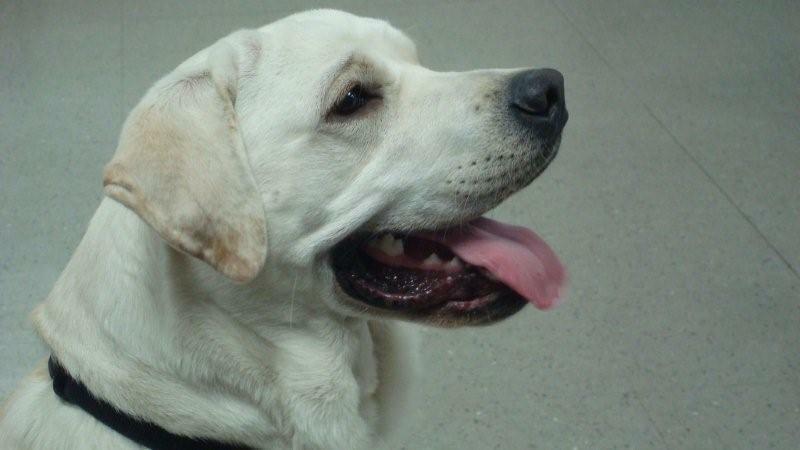 SSD Phillip is now a working service dog. He was placed with his partner in October, and they are doing very well together. When you see them together, you can tell that they love each other. 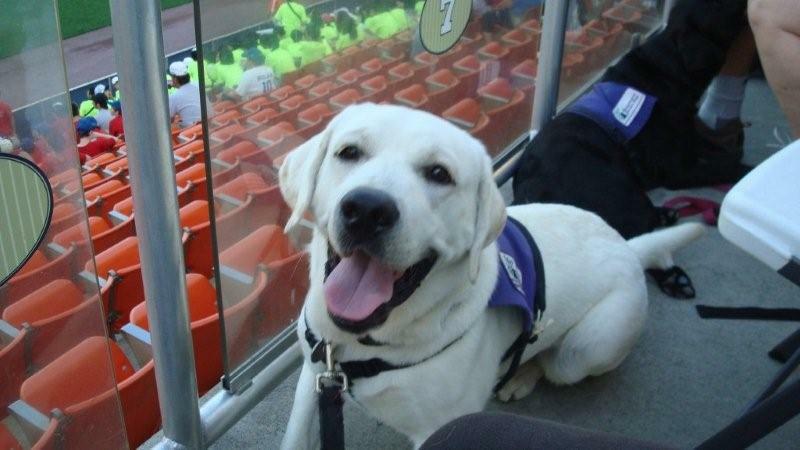 Phil is thankful for the trainers who made it possible for him to become a service dog for his partner. After spending his first eighteen months with his puppy raisers, he came to the kennel for advanced training. In advanced training, his trainer worked with him every day to teach him the skills he would need to support his partner. He learned "visit" (dog puts its head in your hand or on your lap), "touch" (dog touches you with its nose), and "lap" (dog rests its legs in your lap). In addition to the trainers who taught him his specialized skills, Phil is thankful for all of the volunteer trainers who worked with him in public. All of the dogs in advanced training go on public outings twice a week, and each dog works with one of our wonderful volunteer trainers. These volunteers practice good public behavior with the dogs in advanced training - loose leash walking, going under benches and tables to become invisible, calm greetings, and more. Phil enjoyed working with everyone while he was in advanced training! Thank you to both our trainers and volunteer trainers for your dedication to preparing Phil and the other dogs in advanced training to become happy, successful service dogs!